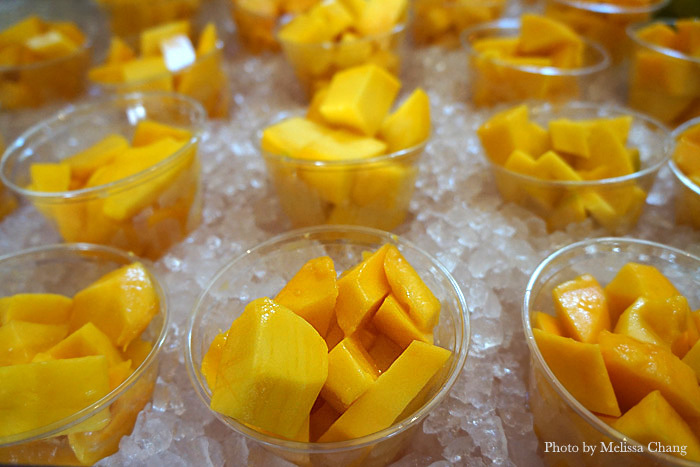 Can you believe it’s been seven years since the first mango festival at the Moana Surfrider came to be? I remember when it was held out at the Sheraton Makaha, coordinated by Mark and Candy Suiso of Makaha Mangoes right in their neighborhood. The concept was so popular, Starwood brought it to Waikiki so more people could celebrate one of our favorite summer fruits. Refreshing cups of Makaha mangoes for $5 at Mangoes at the Moana. They still have a farmer’s market, mango seminars and workshops, free mango cooking demonstrations, plus the best mango contest (where you bring two backyard mangoes for experts to judge). This year they also had a silent auction, as well. There were three celebrity emcees: Guy Hagi of Hawaii News Now, comedian Augie Tulba, and our own Will Chen. 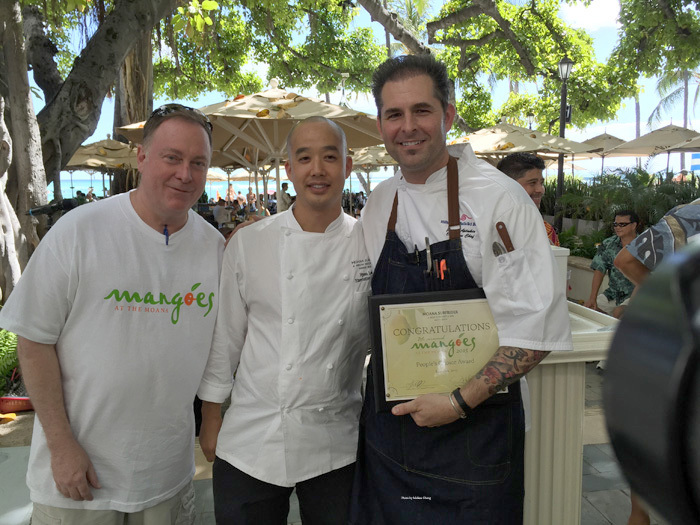 For 2015, eight renowned Oahu chefs participated in the most popular event, the mango throwdown. Each team had to come up with a mango-themed dish, and were scrutinized by the public as well as a panel of judges. Each plate cost $6 but these were well worth it. Ni’ihau lamb dumpling with mangoes by Lee Anne Wong. 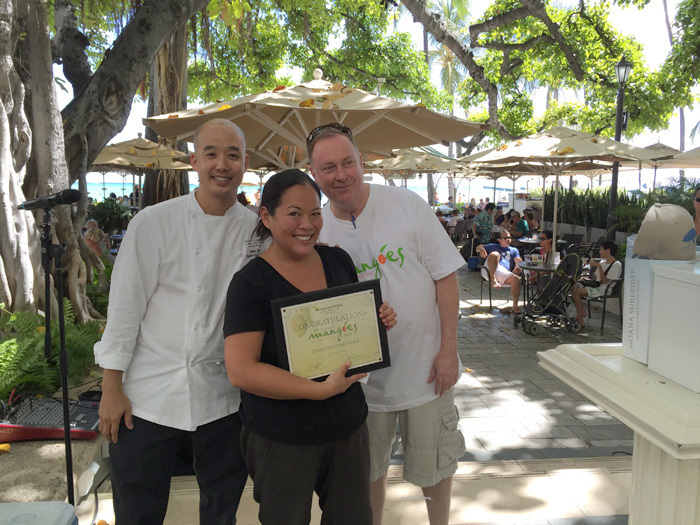 One of my favorite dishes was the Ni’ihau lamb dumpling by Lee Anne Wong of Koko Head Cafe. Hopefully this is a new menu item! Sweet, savory, tender, you name it. I could eat a regular serving of this. Lee Anne ended up winning, for the second year in a row, first place in the judge’s choice. Mango “sorb-eiche” by James Aptakin of Mac 24-7. My other favorite won, too! James Aptakin of Mac 24-7 is known for making some elaborate, labor-intensive dishes for these events, and he did not disappoint. 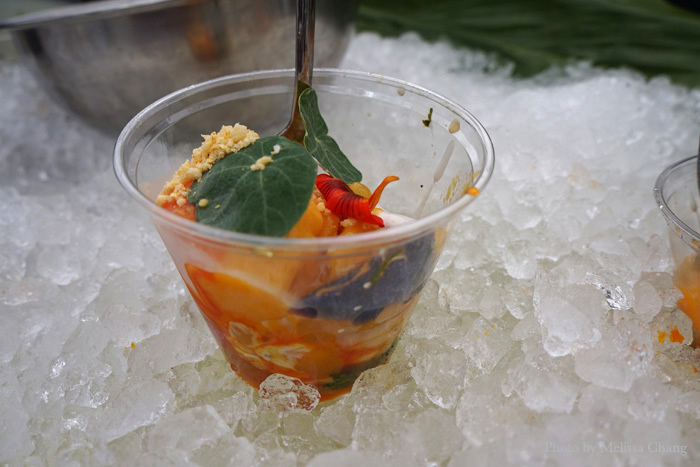 He made a shrimp ceviche topped with mango ginger carrot sorbet and a shrimp powder (freeze dried from stock from the shrimp shells) and pop rocks with flowers, Peruvian purple potato, coconut milk, habanero salt, and who knows what else. James won the people’s choice award. Here are more scenes from the Mangoes at the Moana, including the other dishes we tried. I’ll be honest, I liked all of the dishes they served. It was probably a tough job to judge them, so I’m glad I got to relax and just eat. 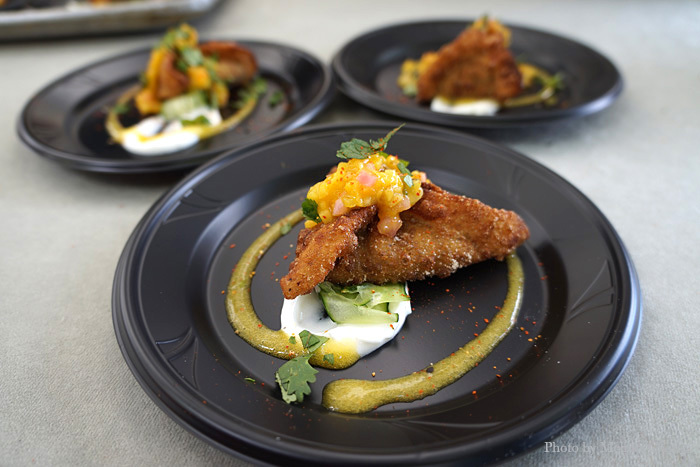 Shaymus Alwin of Azure made cold Kona lobster with green mango and jicama salad, mango horseradish, chicharrones and ikura.